Yeee haaaa! 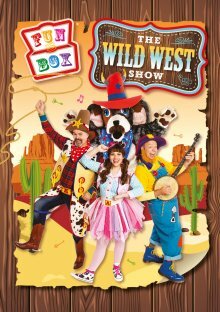 Saddle up partners as FUNBOX head out on the prairie for their brand new spectacular for 2019 – THE WILD WEST SHOW. Get your cowboy or cowgirl boots and spurs on and join us for a rootin’ tootin’ hoedown with Anya, Kevin, Gary and Bonzo (formerly of The Singing Kettle). Who’s the quickest draw in town? Who will wear the Sheriﬀ’s silver star? Can you eat too many baked beans? And will they ﬁnd their missing keys by High Noon? Jam packed with singalong favourites like Skip To Ma Lou, Oh My Darling Clementine , as well as brand new songs, THE WILD WEST SHOW is a right-rollicking rodeo ride for all the family. Yippie Ki Yay!!! !